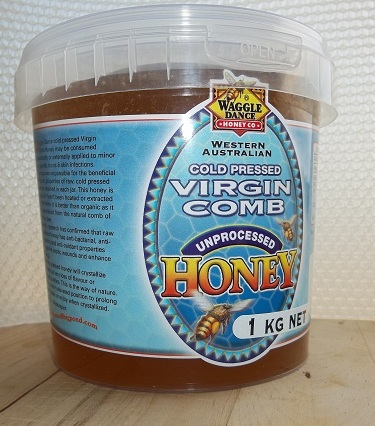 Cold pressed Virgin Comb Honey may be consumed therapeutically or externally applied to minor cuts, wounds, burns & skin infections.The enzymes responsible for the beneficial therapeutic properties of raw, cold pressed honey are retained in each jar. This honey is unique as it has not been extracted from the frame.Simply drained from the natural comb of the honey bee straight into your jar. Scientific research has confirmed that raw cold pressed honey has anti-bacterial, ant-inflammatory and anti-oxidant properties that deodorize septic wounds and enhance well-being. Raw cold pressed honey will crystallize rapidly without any loss of flavour or medicinal qualities. This is the way of nature. Store in a warm elevated position to prolong the liquid state.